Published on July 23, 2008 in Homebrew. 3 Comments Tags: beginner, fermentation friday, process. July’s Theme: What one tip would you give a beginner homebrewer before they brew their first batch and why? 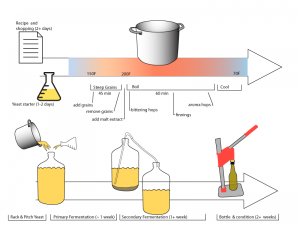 When I first read this topic, my immediate answer was “sanitize twice!” However, I’ve just brewed with someone for the first time and I think the most reassuring thing is that the brewing process is really quite simple. 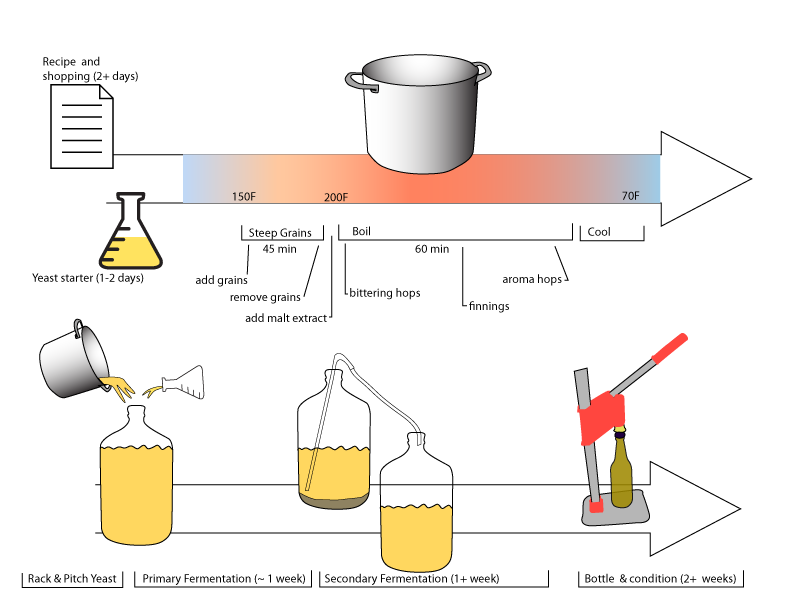 Sure there are lots of rules, but overall, once you see the process, it’s really easy to brew. And, once you know the process, you can try new things, make tweaks that suit your setup and more. Here’s a snap shot of the process. Maybe calling it simple is misleading, but maybe a road map will help the first timer. Here’s a PDF as well. This graphic is awesome. Other than your cleanliness comment I’d also suggest, if possible, to brew with someone who has done it before. New things are much less overwhelming when you’re doing them with a vet. Joe’s right — this image helped me a lot. That said, it took me about ten minutes to find it again today, so I think you should promote it to its own page, or at the least, link it from the process page. Thanks!